Toledo, OH, April 2, 2019 – Luber-finer®, a leading brand in heavy duty filtration since 1936, has announced the latest expansion of the filter company’s Digital Advantage Program. 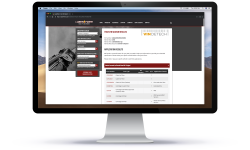 Now accessible on luberfiner.com and available in the future on the Luber-finer mobile app, Vindetech is the first online Vehicle Identification Number search tool in the heavy duty filtration market. Luber-finer’s new digital resource allows users to enter the VIN from an on-road heavy duty truck and find the exact filters they need for that vehicle.